The outdated bridge connecting White Salmon and Hood River must be replaced. With narrow lanes, lack of safety shoulders, difficult barge navigation, and no bike or pedestrian path, the bridge does not meet our current needs. In addition, the existing bridge is not ready for an earthquake. The State of Oregon awarded the Port of Hood River $5 million to advance the project to replace the bridge. Tolls will continue to play a critical role in financing the replacement bridge. The next step in the process requires completion of the environmental review. A new bridge would improve the movement of people and goods across the Columbia River in our part of the Gorge. The proposed replacement bridge facility would address problems with river navigation, vehicle travel, pedestrian/bicycle connections, and safety. A new bridge also would support a thriving economy and livable communities. Learn about ongoing actions to maintain the current bridge. Project staff are reaching out to Columbia River vessel owners and operators to gain information on size and types of vessels that transit under the Hood River-White Salmon Bridge. Information is needed to ensure the replacement bridge will continue to allow for commerce and recreation up and downstream of the bridge. Commercial and industrial river users are asked to complete a River User Data Sheet for each vessel by March 30, 2019. Find more information here. Join us throughout the project by attending a meeting of the EIS Working Group. This group meets about quarterly to provide guidance to the project team. Email our team with questions or comments: newbridge@portofhoodriver.com. 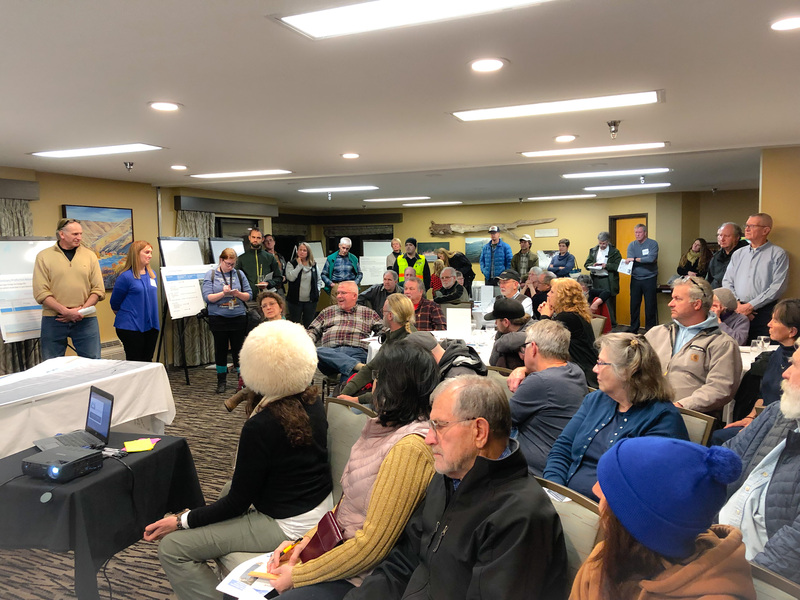 More than 40 people attended the December 10, 2018 community meeting. The Port secured funding from the State of Oregon for the project’s next steps after prior studies were funded through Washington state efforts. This was in part thanks to the passage of Oregon HB 2750 and HB 2017 “Keep Oregon Moving” during the 2017 Oregon Legislative Session. The funding is expected to support the environmental review process and financial analysis. It could also be used to begin preliminary engineering. Building a large piece of bridge infrastructure requires significant resources. Toll revenue will provide essential local match funds for grant funding. The Port currently uses toll revenue for bridge maintenance. Tolls will continue to play a critical role in financing the replacement bridge. Learn more about the history of the bridge and tolling. Significant efforts to replace the bridge have been underway since the 1990s primarily led by Washington legislators. Building on this effort, the Port of Hood River Commission started pursuing next steps and funding in 2015. The graphic below summarizes the project timeline. The Port will update the technical analysis and complete the necessary environmental documentation to build upon the original Draft Environmental Impact Statement (DEIS) published in 2003.